WHY IS CANELO ALVAREZ REALLY FIGHTING ROCKY FIELDING? So, why, exactly, is Saul “Canelo” Alvarez fighting for Rocky Fielding’s WBA super middleweight title on December 15? Canelo missed one of his two yearly paydays this past May due to testing positive for the banned substance clenbuterol, but he surely made enough money for his September15 win over Gennady Golovkin to not absolutely need another payday. In the grand scheme of things, Fielding’s “regular” version of the WBA 168 lb. title doesn’t really mean all that much, either. Fighting at Madison Square Garden for the first time ever in his career is nice and maybe something to cross off a bucket list, but, again, it doesn’t make the Fielding fight anything special or necessary. The real reason behind Canelo coming back in December for this fight may have something to do with shopping himself around for a new (and lucrative) broadcast home. When HBO announced that it was getting out of the boxing business at the end of this year, the decision left a handful of high profile fighters to wade into the waters of free agency. Other than Alvarez, fighters such as Gennady Golovkin, Sergey Kovalev, Dmitry Bivol, and Jaime Munguia will be looking for new US TV deals. None of the new free agents, however, have as high a profile as Alvarez, who can legitimately lay claim to being the biggest draw in the Americas and a top draw worldwide as well. Ready to compete for the services of Alvarez and this new batch of open market talent is old HBO premium cable rival, Showtime, as well as upstart streaming service DAZN and a suddenly boxing-hungry ESPN, which recently allied itself with Top Rank in an effort to provide main network content and exclusive fare for its ESPN+ streaming service. Fox, through its recently reaffirmed alliance with Premier Boxing Champions, also appears to be in the mix when it comes to boxing programming. Even HBO could still be in the picture before closing their boxing doors at year’s end. It’s expected that the bidding war to lure Canelo over to content-hungry networks and streaming services will be intense. And what better way to gauge interest in an open market than by dangling some bait over the shark infested waters? The Rocky Fielding bout may be that bait. On the surface, it appears that Eddie Hearn’s DAZN may have the inside track on getting the US rights to this fight since Hearn is also Fielding’s promoter. Hearn, of course, has gone on record as saying that he’s very much interested in putting the Canelo fight on DAZN. 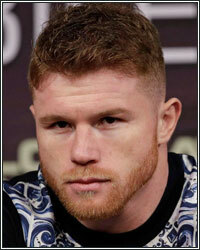 But Canelo has many options and he’s exploring them all. “We’ve been getting a lot of calls,” Golden Boy president Eric Gomez told Boxingscene. “We’re going to sit down with him, Oscar [De La Hoya] and myself – and analyze everything but there’s a lot of offers out there. Maybe the play is to cash in with a perceived soft touch and milk the open market for as much money as possible for a one-and-done fight before REALLY going in for a mega-money long-term deal. Fielding is a capable domestic-level UK fighter and a tough scrapper, but unless something miraculous happens, he shouldn’t be much of a match for Alvarez, even with the advantage of fighting at his natural 168 lb. weight. All the stuff surrounding the Fielding fight, though, is a plus for Alvarez as someone trying to pad a resume and build a legacy—the third world title in as many weight classes, the debut at MSG, the post-Golovkin win spotlight. It’s all attractive. But the money may be the real reward here and Canelo could very well be using this relatively safe Fielding fight to see how much interest there truly is in wooing him to a new broadcast home.